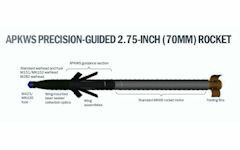 The Advanced Precision Kill Weapon System turns a standard unguided 2.75-inch (70 millimeter) rocket into a precision laser-guided rocket to give warfighters a low-cost surgical strike capability. 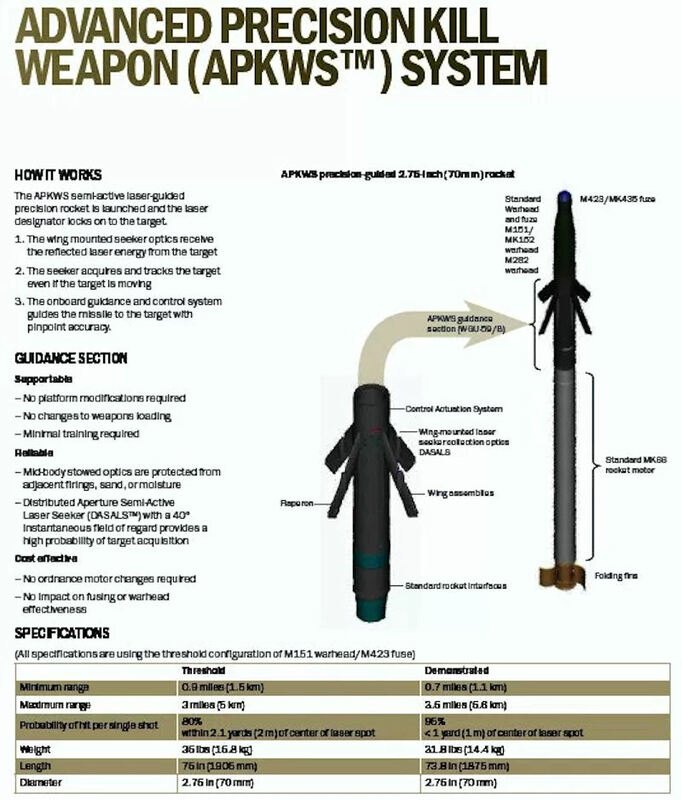 In full rate production, the APKWS rocket is the only U.S. Department of Defense fully qualified guided 2.75-inch rocket. It uses semi-active laser guidance technology to strike both soft and lightly armored targets in confined areas, providing greater accuracy and mission effectiveness. The Army's Advanced Precision Kill Weapon System (APKWS) was intended to fill the gap between the existing unguided 2.75"/70mm Hydra-70 Rocket System and the HELLFIRE anti-tank missile. It was anticipated that APKWS would be comprised of a laser sensor and guidance package coupled with the Hydra-70 rocket. It would be designed for use with the current Mk 66 series of rocket motors, M151 10-pound high explosive fragmentation warhead, M423 point detonating fuse, and the M260 or M261 rocket launcher. The Mk 66 series of rocket motors and associated component parts (warhead, fuze, etc.) were those that were already in the inventory. However, the APKWS was designed to be compatible with any 2.75"/70mm rocket system in the inventory at time of acquisition. The rocket warhead and fuze were integrated with a laser sensor and a highly accurate guidance assembly resulting in a precision guided weapon. The APKWS was programmed with the aircraft's compatible laser code and loaded into the aircraft rocket launcher(s). The APKWS was designed and intended to enhance the existing rocket system and to complement the HELLFIRE missile system, providing a significantly lower cost per kill against soft to lightly armored point targets. Precision guidance and warhead size of the APKWS would significantly reduce collateral damage. These features made APKWS the potential weapon of choice during operations in urban terrain or for aerial fire support missions in close proximity to friendly forces. The APKWS would be employed from attack, armed reconnaissance, or other designated helicopters. While operation was expected to be much the same as with HELLFIRE (using laser designation of the target), the smaller warhead, less complex seeker, and utilization of the Hydra-70 rocket would allow precision engagement of soft to lightly-armored targets at significantly lower costs than with HELLFIRE. 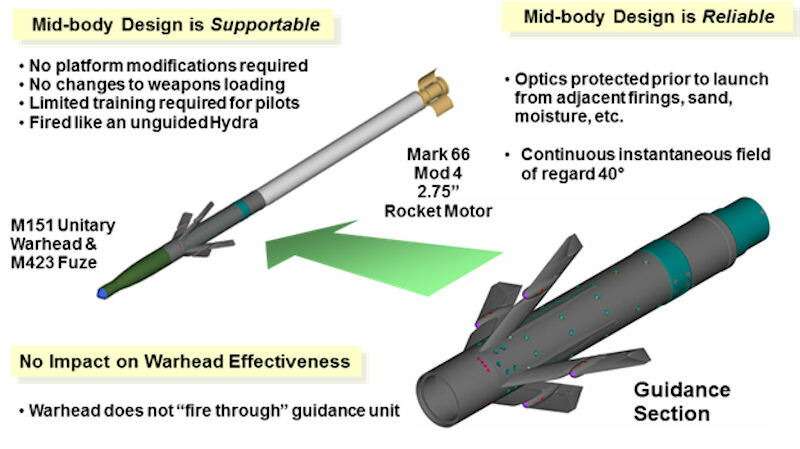 The APKWS study was an effort to evaluate the cost-benefit of modifying the 2.75"/70mm unguided rocket with a laser sensor to increase the number of "stored" kills per attack/scout helicopter. The methodology considered the type threat units likely to be encountered in various locations of the world, the number of candidate targets for the APKWS, the potential combat effectiveness of an Aviation Restructure Inititive (ARI) interim attack battalion, and the potential for cost savings to attrit the threat units to two different levels. The study also evaluated the impact of collateral damage control and logistics. The Low Cost Precision Kill (LCPK) need was realized during investigations of Desert Storm that revealed a large number of HELLFIRE firings were made against non-tank point targets that could have been killed by a smaller weapon. Recent Military Operations in Urbanized Terrain (MOUT) activities in Panama, Somalia, and Haiti dictated the need for an air-to-ground (ATG) LCPK weapon system, smaller and less costly than HELLFIRE, to increase stowed kills of non-tank targets such as selected personnel, air defenses, small watercraft, MOUT targets, and lightly armored vehicles with point target accuracy and with minimum collateral damage. Army Aviation had a requirement for a small, low cost Advanced Precision Kill Weapon System (APKWS) to fill the weapon gap between the current unguided 2.75"/70mm rocket system and the HELLFIRE anti-armor missile. This requirement was documented in a Mission Need Statement (MNS) for APKWS, which was approved by DA in February 1996. The APKWS Operational Requirements Document (ORD) was approved by TRADOC headquarters in March 2000. The LCPK Advanced Technology Demonstration (ATD) performed jointly by the Missile Guidance Directorate (MGD) and Aviation Applied Technology Directorate (AATD) elements of the US Army Aviation and Missile Command's (AMCOM) Aviation and Missile Research, Development and Engineering Center (AMRDEC) headquartered at Redstone Arsenal, Alabama would demonstrate a low cost (< $10K), accurate (~1m CEP) 2.75"/70mm guided rocket that would provide a standoff range ( 6 km), surgical strike capability against specified soft point targets. Utilizing a small, strapdown laser seeker, off the shelf inertial devices and a low cost control mechanization, a high single shot probability of kill was expected to be achieved, reducing cost/kill by 2x-4x, minimizing collateral damage, and increasing the number of stowed kills by 4x-20x. A stable airframe with 90% reduction in guidance section spin rates was demonstrated via wind tunnel and ballistic flights. By end of FY00, 10x reduction in 2.75"/70mm rocket dispersions was expected to be demonstrated via control test vehicle (CTV) flights. By the end of FY01, ~1m CEP accuracy would be demonstrated via guided test vehicle (GTV) flights from ground launch, guided rocket performance specs documented, and AH-64D aircraft integration completed. By end of FY02, GTV flights from the AH-64D aircraft were to completed. By the end of FY03, user tests completed and aircraft performance specifications were to documented. The LCPK Advanced Technology Demonstration purpose and goal was to develop, flight demonstrate, and integrate onto the AH-64D Longbow Apache a low cost, accurate 2.75"/70mm guided rocket that provided a standoff range surgical strike capability against specified soft point targets, addressing the APKWS needs. 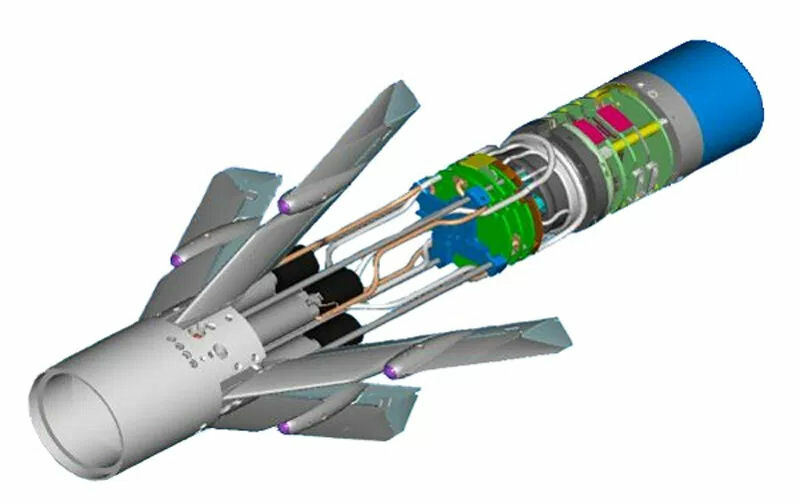 The technologies demonstrated for the LCPK 2.75"/70mm guided rocket would include small low cost solid state semi-active laser (SAL) seekers to acquire reflected laser energy, canard or thruster controllers to provide aerodynamic control authority, small low cost off the shelf inertial devices to provide inertial information for rocket control, and an innovative de-roll coupling device to provide some roll isolation from the highly rolling free rocket. The guidance package would be a direct screw-on to the existing Hydra-70 rocket motor, warhead, and fuze. The operational characteristics to be demonstrated were as follows: The SAL guided 2.75"/70mm rocket would be launched like a free rocket, the target would be tracked and lased like a HELLFIRE mission, the guided rocket would lock on after launch (LOAL) similar to a miniature Copperhead, and a terminal homing phase utilizing proportional navigation would produce precision accuracy for a high single shot kill. A full-up 2.75"/70mm guided round for transition into Engineering and Manufacturing Development (EMD) was to be developed and demonstrated. Army Aviation hoped to reap great benefit in all operations by arming aircraft with the lightweight precision targeting capability offered by the LCPK 2.75"/70mm guided rocket solution to their APKWS requirement. The smaller warhead of the LCPK was expected to greatly reduce collateral damage while providing sufficient lethality to destroy non-tank point targets. Its lightweight construction would also allow aircraft to increase station time, maintain maneuverability, and decreases overall maintenance demand. The LCPK stand-off range and precision strike capability would greatly increase platform combat effectiveness, lethality, and survivability. The LCPK eventually would be compatible, with minor system modifications, to the AH-64A/D, RAH-66, OH-58D, MH-60L, AH-1F/W/J, SH-60R, AH-6 and the AH-6 Mission Enhanced Little Bird (MELB) aircraft as a threshold. APKWS was expected to provide Army aviation with a low cost, highly accurate weapon for engagement of light-armored and soft point targets. It offered high single shot probability of hit against medium to long range point targets (1 km to >6 kms). The weapon would enhance aviation's capability and lethality in all roles, especially MOUT, early entry, and aerial fire support missions. Initial plans, funding permitting, called for fielding of APKWS in FY02. As of 2001 the Advanced Precision Kill Weapon System was not expected to be fielded until FY06. As of November 2001 the System Development and Demonstration (SDD) phase was basically qualifying a M151 2.75 inch rocket with a guidance component under a performance specification with options for: acquiring long lead materials/initial production facilities, engineering services, Low Rate Initial Production, the first year of full production, and acquiring a Technical Data Package. A multi-step approach was being considered. A subsequent production contract would be awarded on a Firm Fixed Price and sole source basis to the successful system integration offeror of the SDD contract provided the required performance was achieved and maintained. It was anticipated that the production contract would be a five-year award term with a potential extension to another five years with successful performance against measured criteria. In addition to the guided M151 2.75 inch rocket, the production contract would have been flexible to include a family of other precision rockets that may have included the existing configuration M261, M264, M255A1, M229 M257, and M278 2.75"/70mm rockets, with or without a guidance component, system integration functions, technology enhancements, inventory upgrades, block upgrades, and engineering services. Potential offerors timely responded to this announcement. Subsequent to this announcement, a thorough analysis was undertaken relative to the impacts this original acquisition approach had on the Government's ability to preserve a critical industrial supplier capability for the family of 2.75"/70mm rockets. In September 2002 APKWS was further defined as an umbrella program that initially included the guided M151 2.75 inch rocket with future block upgrades and also included a family of other precision and unguided rockets utilizing existing warheads (M151, M261, M264, M267, M255A1, M229, M257, M274, M278, and WTU-1/B), with or without a guidance component, system integration functions, technology enhancements, inventory upgrades, logistics support, initial production facilities, prod ucibility issues, investigation support, future block upgrades, enhancing digital capabilities to include an improved launcher, test equipment, packaging, and engineering services. The Government intended to enter into a 5 year Award Term sole source contract with General Dynamics Armament and Technical Products (GDATP) for APKWS with the capability to extend the contract up to an additional five annual performance periods if actual contract performance met or exceeded the standards established in the award term plan. Additionally, it was anticipated that GDATP would issue a competitive solicitation for the guidance component to cover a System Development and Demonstration phase, which was basically qualifying a M151 2.75 inch rocket with a guidance component under a performance specification with possible options for: acquiring long lead materials/initial production facilities, engineering services, low rate initial production, two years of full production, production representative samples, etc. In October 2016 BAE Systems was awarded a three-year contract from the US Navy worth up to $600 million to support deliveries of its Advanced Precision Kill Weapon System (APKWS). This is the first indefinite delivery, indefinite quantity (IDIQ) contract for the precision-guided weapon system, and would support a ramp-up of deliveries from 1,500-2,000 units at the current rate to 5,000 in the first year of the new arrangement.